Sometimes saving money can be tough. It’s a mind over matter type of thing. You know you shouldn’t be spending money but you just want to. You convince yourself that you need items that you really don’t need. I know what it’s like. 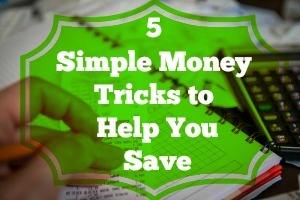 Luckily there are some simple money tricks that can help you save. The trick that works the best for me is calculating the cost by hours worked. On average I’d say I make somewhere around $20 per hour. Therefore if I want to buy something that costs $100 I’d have to work 5 hours to pay for it. In my case this usually isn’t worth it at all. I value my time and working extra hours to pay for useless stuff isn’t my cup of tea. Next time you’re in the mood to buy something calculate how many hours you’d have to work to pay for it. It will put things in perspective for you. Practice telling yourself no. This is a great self-discipline exercise and will prove very useful in aiding you to save money. The next time you want to buy something that you don’t need just tell yourself no. After a while this will become second nature. If you don’t like the idea of telling yourself no altogether, just do it for twenty four hours. Before you make a purchase sleep on it. Chances are you’ll change your mind the next day. This will curb all of your impulse purchases. When you’re grocery shopping make a list and stick to it. Then walk through the store and grab only the things that are on your list. You’ll save yourself time and money. This often preached financial advice is harder than it seems. You can start by first having your retirement savings automatically taken out of your paycheck. If your employer offers another savings program, say through a credit union, have money taken out of your check and direct deposited into a savings account. By doing this you can reach your savings goal without much effort and after a while you won’t even notice the decrease in your paychecks. None of these things are easy to do in the beginning but the more you practice them the easier they’ll become. Pick one or two of these strategies and start implementing them. After about a month it’ll just be second nature to you. What other money saving tricks do you use?